Foxhills Club & Resort is basking in a golden glow after success at the prestigious annual 59club golf customer service awards. The historic club, based in Ottershaw, Surrey, retained its coveted ‘gold flag’ at the glittering awards ceremony for its exceptional overall standard of consistent performance throughout 2017. Foxhills director of golf, Chris Fitt, collected the award as representatives of many of the world’s leading golf destinations gathered at The Grove, Hertfordshire to recognise the standards of service and excellence throughout the golf industry. Also nominated were Aditi Auluck (Leading Individual Golf Membership Performance) and David Wyborn (Greenkeeper of the Year), which saw them named among the top-five across Europe and the Middle East in their respective categories. Fitt said: “It’s fantastic recognition for the work that goes on at Foxhills. 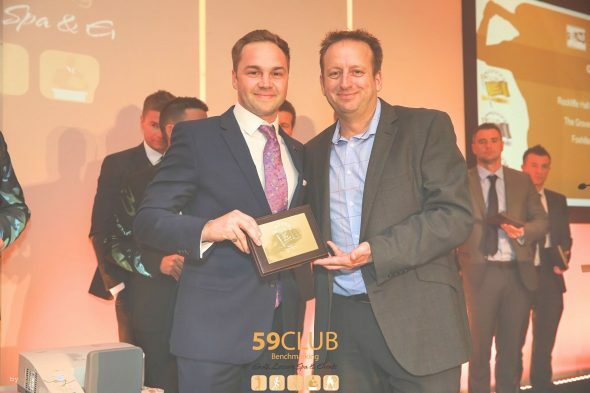 59club is one of Europe’s foremost service benchmarking organisations, and the awards evening recognises its top performing clients and their staff across all business elements – sales, service, operations, retail, golf course, food and beverage, and management – based on the scores received as part of the benchmarking process. Audits include a series of mystery test calls and visits from 59club testers, who evaluate the experience afforded to both visiting golfers and prospective members, in accordance with 59club’s criteria.